Machinery: Geared turbines. S.H.P. 52,000 = 28.2 kts, 2 shafts. Shoho, light aircraft carrier, entered service in January 1942. Originally the fast submarine support ship Tsurugisaki, which had been completed at Yokosuka Dockyard in 1939, the ship was renamed and her conversion to an aircraft carrier begun in 1941. 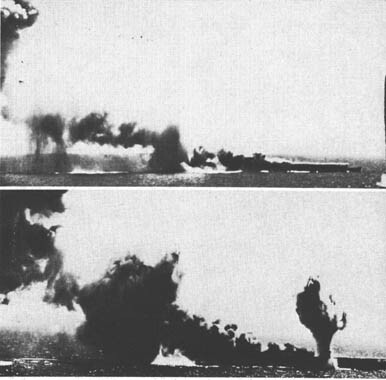 On 7 May 1942, during the Battle of the Coral Sea, Shoho was sunk by an overwhelming dive bombing and torpedo attack delivered by aircraft from USS Lexington (CV-2) and USS Yorktown (CV-5). ZUIHO - She was sunk off Cape Engano on Oct.25, 1944 during the Letye Gulf battles.